Operation ‘clean house’ – whisky style! Let’s be honest, if you are anything like me, after opening a bottle for a tasting session, most tend to get set aside – either as it was so special it is carefully kept to share at some mythical future moment, it was too much of an experiment to want to repeat, it was stored in some deep dark inaccessible corner, or the mood to try again simply didn’t strike. It may seem strange that someone who enjoys exploring whiskies isn’t really a ‘drinker’. But the truth is, I don’t sit around having a dram each night. Which means I’ve been known to keep an open whisky bottle for months, nay years! So when I thought we’d have to move from our beloved Bandra flat in Bombay, realized it was high time to purge possessions and reduce clutter. That the move has been postponed a few years is irrelevant to this tale. What matters is it prompted operation ‘clean house’ – whisky style! 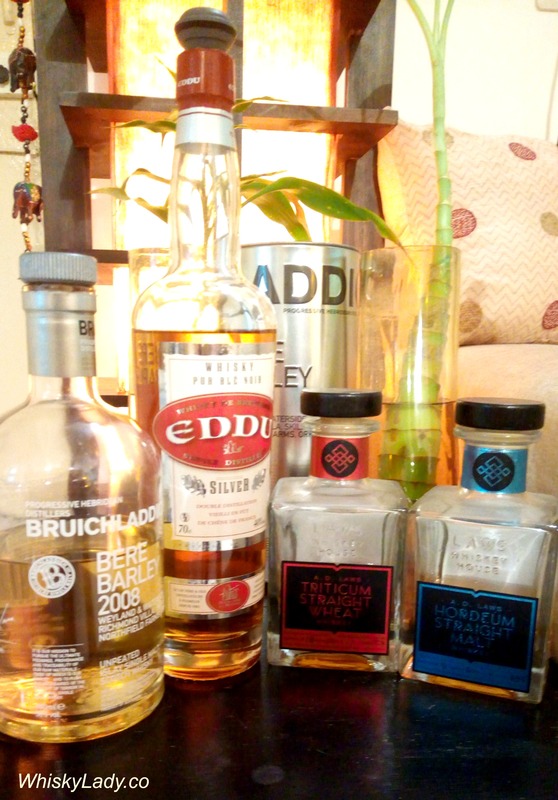 Now… as you can imagine… I have a rather motley collection of malts. More than the large bottles, there are all the partly finished miniatures and samples to contend with… which means no ordinary sociable evening would suffice. Unlike a proper planned tasting, dram dregs need a bit of a ‘statutory warning’ as can have a few massive misses along with the hits. You may find a few precious carefully stored whiskies stood the test of time… but others may have tragic consequences and be nothing like their former glory. Your partners in crime need to be game for the highs, lows and sometimes getting only a whisky teaser not a proper snifter. This is no normal ‘tasting session’ but instead a palate twister of unique proportions. Step 2 – Start with a few oldies but goodies – even if only a sample sip! Our 1st ‘operation clean house’ evening began with assorted half sampled minis… In most cases it was at best 1 to 2 sips per whisky. I do believe we managed to empty about 8 or 9 half empty mini bottles… many of which were more unusual and rarer items. My Canadian stashes – both 2015 and 2016 – were all opened, sniffed, even sipped and then summarily dumped! Narry a one was truly drinkable. Lesson learned – never ever store whiskies in jars!!! I had already brought out from my whisky cupboard all the mid to full size open bottles so they were accessible for emptying. In our 1st session we selected the Blair Athol 27 year (stood up well!) and the “Highland Heart” (did not… an odd shadow of its former self) – each having at best a dram or two. A not so gentle reminder that oxidation takes its toll… for quality drams, using a vacu vin stopper seems the way to go!! Step 5 – Rinse and repeat! Don’t try to do everything at once. After our 1st session where we tried over a dozen dram dregs, we decided to be a bit less ambitious in our next round. Less is more. The decision now is whether to do variations on themes or mix things up so there is something to contrast. In our sample sips, most had a heavy sherry influence and it was almost too much of one dimension. And yet there is something to be said for exploration variations of a similar note too – just only a few not 8 or 9! “Educate” our palates on Bere Barley, Buckwheat, Triticum, Hordeum and Four Grain… we may need to carefully select a “reward” after this set! Asian assortment kicking off with the Ki No Bi gin, followed by Chita 12 year, Hakushu 18 year, Ichiro’s Houou-uhi (Phoenix), Taketsuru Pure Malt 17 year, Kavalan Concertmaster plus will see if there is anything that can be done with the Baiju! Mystery malts with samples where the labels came off!! Perhaps we can use these to craft our own blends – see who comes up with the best one… Why not? This entry was posted in Whisky General and tagged Dram dregs, Oxidating whisky, Tasting tips by Carissa Hickling. Bookmark the permalink. Oh what a wonderful problem to have! I mitigate my growing whiskey collection by only buying bottles I can’t sample in tasting sessions, bars or whiskey shows. It cuts out a lot of the clutter. Great way to share out the leftovers however. I wouldn’t say I have a massive collection. The closed bottles are all for one of the different tasting groups here in Mumbai – though the session it is sampled at may be in 2018 or 2019!! It is all the ‘left overs’ that are fun to share… when I have a larger amount, it goes out at more sociable evenings where more people can enjoy. However with the teeny tiny bits and bobs I have at the moment, this mini of minis evenings are great fun!! If you end up with nothing better to do with bottles, creating your own blend could be a fun activity too! Blend a dram in your glass so to say!